Doksuri, the 10th storm arising in the East Sea so far this year, caused five deaths and dozens of injuries in six hours in Vietnam yesterday. The typhoon caused winds of up to 135kmph, cutting power to many localities and affecting 1.3 million people. Thousands of houses were destroyed and power and telecommunications networks were damaged. Thirty three Vietnam Airlines and Vietjet Air flights from Hanoi to HCM City, Vinh, Dong Hoi and Thanh Hoa were cancelled. Vietnam Railways also cancelled seven passenger trains and five cargo trains at stations in Ha Tinh and Quang Binh provinces. In Ha Tinh, the storm caused heavy losses, especially in localities near its eye such as Ky Anh Town. An initial report revealed that more than 23,000 houses had their roofs blown off, while nine villages were submerged. Phan Duy Vinh, Vice Chairman of the Ky Anh Town People’s Committee, said that 80 per cent of houses, schools and health stations were damaged. Deputy Prime Minister Trinh Dinh Dung led a working group to Ha Tinh Province to supervise the storm and flood control and prevention. In Nghe An Province, authorities of Cua Lo Town, a popular tourist beach destination, have already made plans to relocate 1,062 households with 4,506 residents to safer areas. In Quynh Long Commune of Quynh Lưu District, the water level is increasing dramatically and strong waves are hitting the local dam, fueling concerns it will fail. 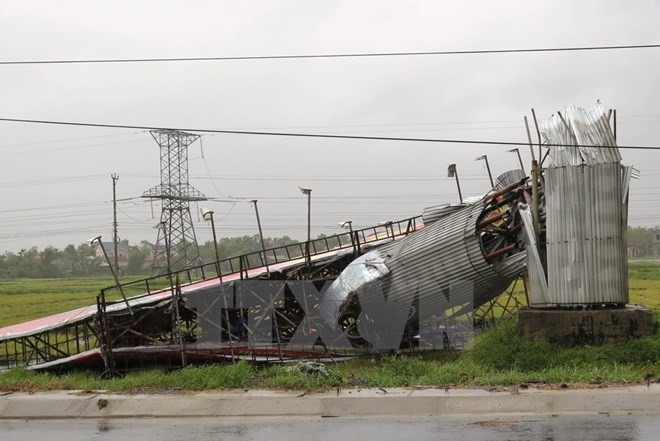 The province is also urging its people to avoid going outside in heavy winds and rain, so they do not fall victim to accidents caused by falling trees, electrical poles and wires. By 3pm yesterday, many roads in Nghệ An were underwater, completely paralysing traffic. Meanwhile, the roofs of about 500 houses in Loc Ha District and 169 others in Cam Xuyen District were ripped off by strong winds, along with floods in many places. In central Thua Thien-Hue Province, a house collapsed and 608 others lost their roofs. At the same time, serious erosion affected 700m of sea dyke in Hai Thanh Village of Thuan An Town and some other localities, forcing 410 households with 1,424 locals to move to safe areas. According to the provincial flood prevention agency, province-wide, 583ha of rice have not yet been harvested and are expected to be lost completely following this storm. Meanwhile, 6,400 fish cages, mostly in Phu Loc District and Phu Vang, are being safeguarded. Nguyen Van Cao, chairman of Thua Thien-Hue Province People’s Committee, said water levels across reservoirs and hydropower dams in the province are at a safe level and no construction is underway. Cao added that 100 tonnes of rice, 100 tonnes of instant noodles, 100,000 litres of petrol, 100,000 litres of diesel and 30,000 litres of oil have been prepared in case the storm lasts several days. In central Quang Binh, the storm left one dead and six injured. It also destroyed 13 homes, unroofed 49,155 houses and flooded 1,500 others. More than 1,000 hectares of rubber trees were also damaged, while many streets were blocked by flooding. Total loss in Quang Binh is estimated at nearly VNĐ1.8 trillion (US$79.21 million). Prime Minister Nguyen Xuan Phuc yesterday canceled work in the southern provinces to fly Da Nang then go to Quang Binh Province by car to inspect the situation and instruct the locality to overcome the consequences of the typhoon. The PM asked local authorities to mobilise all forces to repair houses for people, so nobody is left homeless. After the visit, Phuc had a working session with key leaders of Quang Binh Province in the evening to assess the damage and the work of overcoming the consequences of the storm. The typhoon is forecast to move towards central Laos and weaken to a low pressure system, according to the National Centre for Hydro-meteorological Forecasting (NCHMF). The centre reported that at 5pm yesterday, the storm’s eye was in the Viet Nam-Laos border area with maximum wind speeds of 52km per hour. In the last two days, the typhoon, said to be the strongest in a decade, brought heavy rains to central provinces from Thanh Hoa to Quang Ngai with rainfall of 100-200mm and even 300mm in some areas, along with gusts of up to 80-100km per hour. Today and tomorrow, major floods could occur at rivers in the central region, posing a high risk of flashfloods, landslides, and local floods in the Hoa Binh, Son La, Thanh Hoa and Thua Thien–Hue provinces. Hanoi is also forecast to see torrential rain and strong winds.